Prevailing wages are one of the few protections Michigan has left to avert a real crisis of the state’s already dwindling middle class. As the number of Michigan workers covered by bargaining agreements has fallen, so has Michigan’s middle class with incomes dropping by 11.2 percent between 1979 and 2010. The proposed repeals are just another attempt by corporate front groups like the Associated Builders and Contractors to inflate their profits at the expense of these workers. As Detroit News’ editorial admits, these laws protect all workers, ensuring that a non-union member can earn just as a union member. So repealing these protections could unfairly hurt those without representation the most. These groups know better than to believe that slashing wages will do much more than force workers into longer hours just to make ends meet, but without ever getting enough to make up for the loss. Instead of attracting the best and brightest, driving down wages can actually drive local workers out of local communities. It’s only a matter of time before a higher skilled worker finds a job elsewhere, in a place where hard work is still rewarded. For all the talk about the AEG study, another study out of Michigan State University debunks corporate claims about cost-savings. It turns out that anti-wage measures have no real impact on costs because workers make up for their higher pay with increased productivity. In fact, studies show that construction workers with higher wages and training are at least 20 percent more productive. Now if predatory contractors are serious about cutting costs, they are free to start by taking on the pay of CEO’s, who get 354 times more than they pay their workers. Policy makers have no way of stopping unscrupulous contractors from just pocketing every penny of profit by ripping off taxpayers while gauging workers. Since one of the most powerful drivers for our economy is the middle class, merely having a job cannot be the end goal itself. To promote growth, all those who work, especially in back-breaking construction jobs, must be able to exercise their right to prosper. 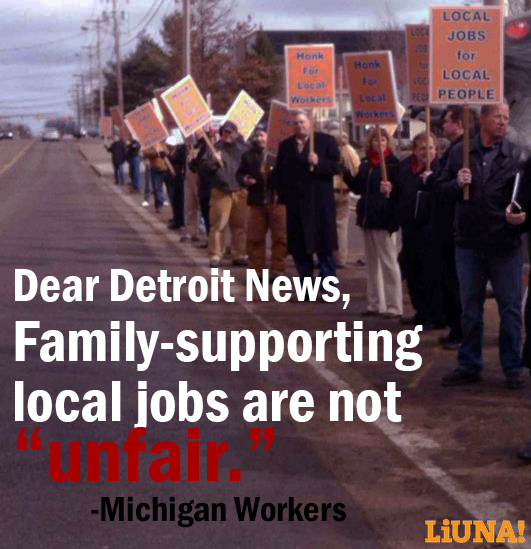 Prevailing wage laws protect that right for Michigan workers.